Astronomers have used Chandra to study a gigantic and resilient "cold front" in the Perseus galaxy cluster. This structure spans about 2 million light years, moves at speeds around 300,000 mph, and is some 5 billion years old. Not only has it survived for so long, the cold front has also remained surprisingly sharp and split into two different pieces. The cold front's sharpness suggests that magnetic fields are wrapped around it, preserving it. The cold front is the long vertical structure on the left side of the image (rollover the image above to view labels). It is about two million light years long and has traveled away from the center of the cluster at about 300,000 miles per hour. The inset below shows a close-up view of the cold front from Chandra. This image is a temperature map, where blue represents relatively cooler regions (30 million degrees) while the red is where the hotter regions (80 million degrees) are. The cold front has not only survived for over a third of the age of the Universe, but it has also remained surprisingly sharp and split into two different pieces. Astronomers expected that such an old cold front would have been blurred out or eroded over time because it has traveled for billions of years through a harsh environment of sound waves and turbulence caused by outbursts from the huge black hole at the center of Perseus. 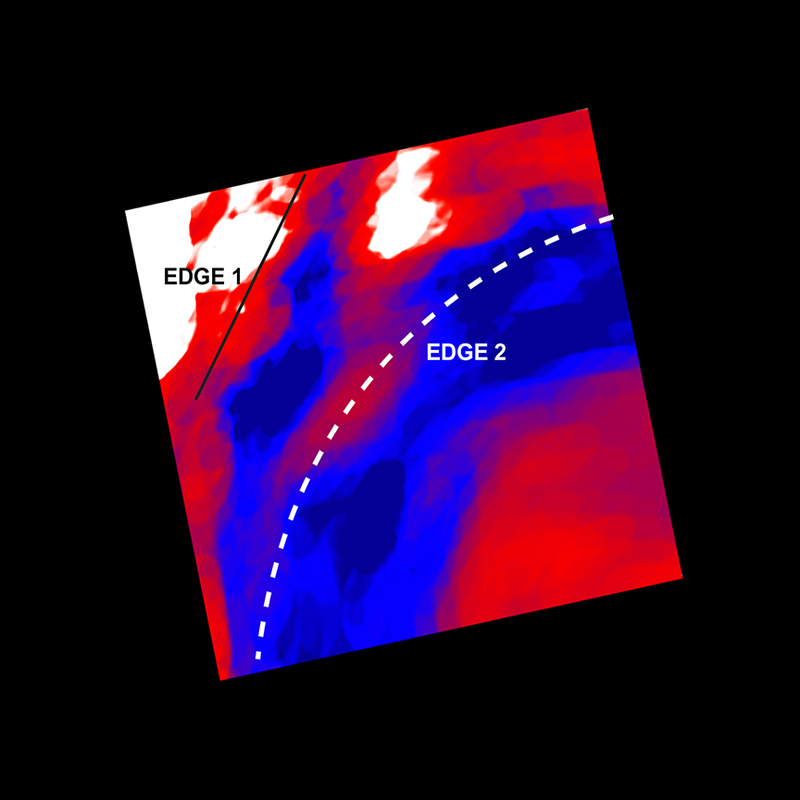 Instead, the sharpness of the Perseus cold front suggests that the structure has been preserved by strong magnetic fields that are wrapped around it. The comparison of the Chandra X-ray data to theoretical models also gives scientists an indication of the strength of the cold front's magnetic field for the first time. While cold fronts in the Earth's atmospheres are driven by rotation of the planet, those in the atmospheres of galaxy clusters like Perseus are caused by collisions between the cluster and other clusters of galaxies. These collisions typically occur as the gravity of the main cluster pulls the smaller cluster inward towards its central core. As the smaller cluster makes a close pass by the central core, the gravitational attraction between both structures causes the gas in the core to slosh around like wine swirled in a glass. The sloshing produces a spiral pattern of cold fronts moving outward through the cluster gas. 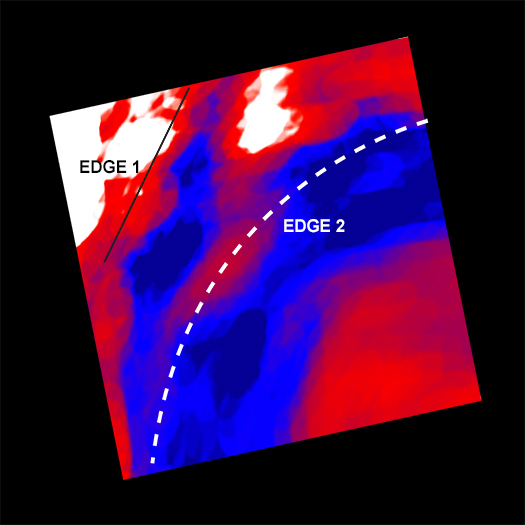 Aurora Simionescu and collaborators originally discovered the Perseus cold front in 2012 using data from ROSAT (the ROentgen SATellite), ESA's XMM-Newton Observatory, and Japan's Suzaku X-ray satellite. Chandra's high-resolution X-ray vision allowed this more detailed work on the cold front to be performed. Scale Image is about 42 arcmin (about 3 million light years) across. 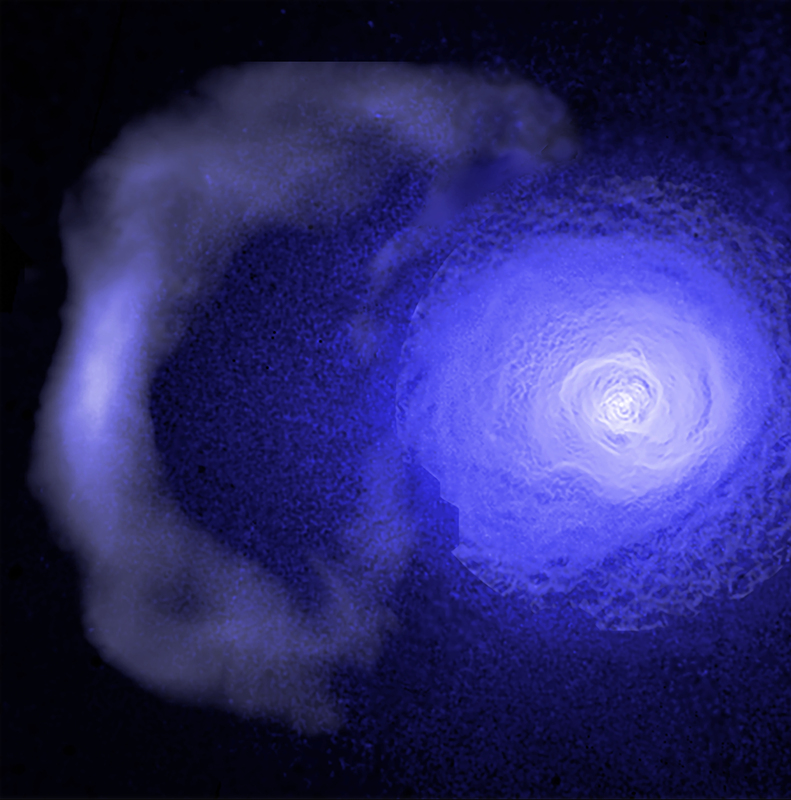 A cold front in the Perseus Cluster. About 250 million light years from Earth. Combines X-rays from Chandra X-ray Observatory, XMM-Newton & the German Roentgen (ROSAT) satellite.